Once upon a time there were deer and deerskin. And there were cyclists racing in woollen shorts. Since then the sportswear used in cycling, like all other sports, has undergone an incredible technological revolution: the introduction of science to help improve performance paved the way for major progress and now we can’t do without it. A good cycling pad can have a positive impact on a cyclist’s performance and health. No matter how far or over which terrain you plan to ride, there is a pad that is just right for you and your needs: choosing the right cycling shorts fitted with the right padding for your size and body shape ensures greater comfort on any ride. Elastic Interface® has developed the most comprehensive range of cycling pads that adapt perfectly to how a rider moves throughout every pedal stroke. Every product is tested by pro riders and experienced amateurs, and the long-standing relationship with the Department of Biomedical Sciences at the University of Padua, which began in 2006, has given rise to unique articles about pads that have been published in international medical and scientific journals. 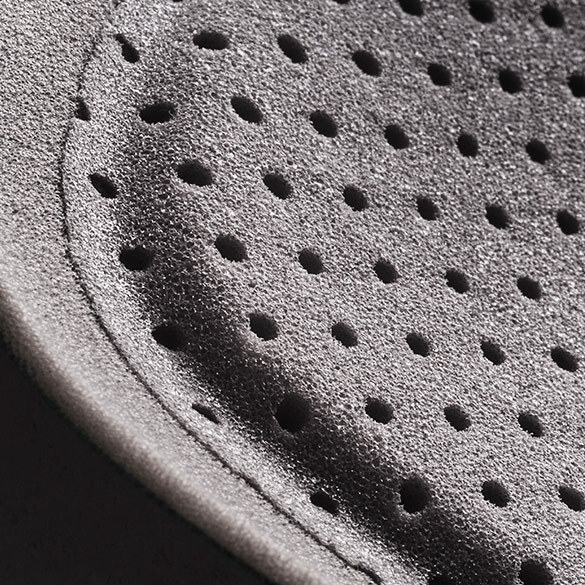 Elastic Interface® was the first manufacturer to make a cycling pad with stretch. Nowadays it seems almost old-fashioned to talk about elasticity in a world where practically every fabric we wear contains some elastane, but once upon a time things were very different. The change from stiff deerskin chamois to soft, comfortable, stretchy pads that adapt perfectly to fit a rider’s body has been a long road with many technological innovations. The knowledge and understanding acquired during our years of experience, research and development have allowed us to achieve the highest levels of performance and a product that always responds to the latest developments as well as the demands of today’s cyclists. In an endurance sport like cycling, ensuring the correct position in the saddle is an essential part of achieving top-flight performance and avoiding muscle and joint pain. Furthermore, state-of-the-art testing in our EIT LAB laboratories has proven that wearing a properly designed pad to support the areas most prone to pressure and friction helps to improve a rider’s posture and comfort, which means better results. Having an expensive, high-performance bike and saddle is rather useless if we keep wearing a poor-quality pad that fails to provide the right amount of support and protection. Riders wearing more comfortable, better-performing cycling pads waste less energy, offload less weight on the handlebars and enjoy better stability in the saddle. When riders are uncomfortable and not sitting in the best position for prolonged periods, they continually move about on the saddle, shift their weight onto the handlebars instead of the pedals and generally waste a great deal of energy. This is even more obvious during a race, when any little detail can be a deciding factor. Wearing the right pad for your gender and speciality and sitting in the correct position in the saddle are some of the most important parameters when striving to improve performance and safeguard the health of all riders. 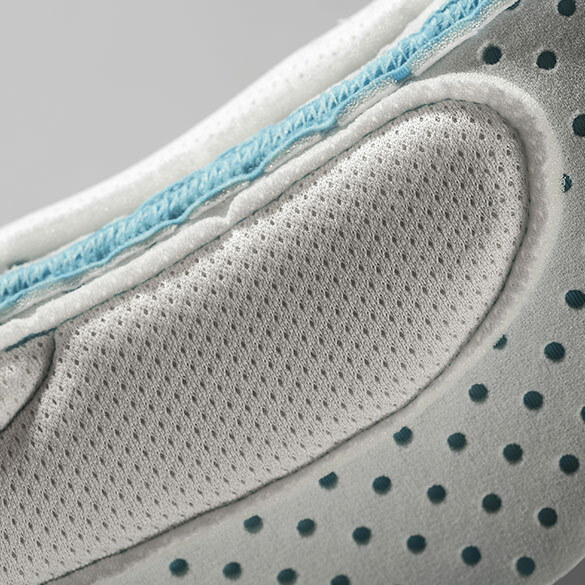 There is more technology in cycling pads than ever. Cyclists go technical and they choose their apparel according to exact performance goals. This is why we can’t use paddings that only ease pain, but we develop solutions that help athletes to go over their limits. To do that, materials are not enough: we use innovative construction technologies to deliver comfort and perfect fit. Elastic Interface® has engineered two types of pad construction: thermo-molded and stitched. 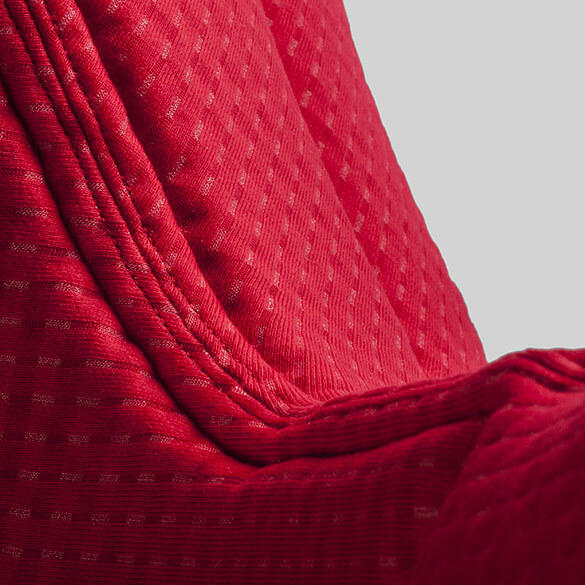 Both technologies guarantee the highest standards of comfort, protection, breathability and performance; a sustainable cutting system in production planning, then, allows us to use drastically less raw material than other solutions currently available on the market. 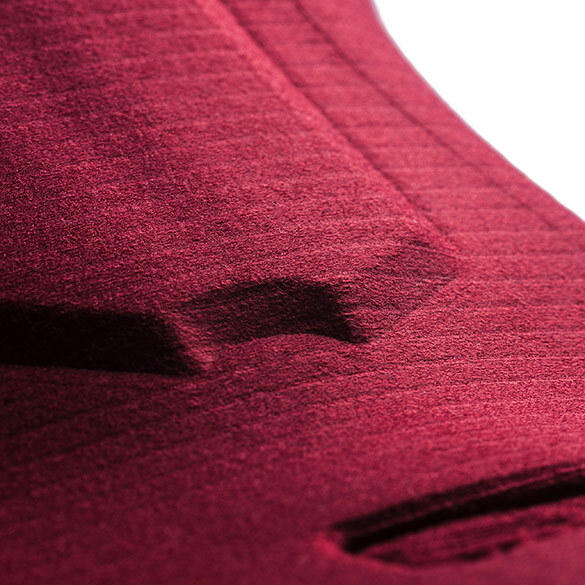 Our top choice products benefit from an anatomic shape, which is determined by a different technique for each technology: a multidirectional curvature for our thermo-molded cycling pads and an anatomic construction for the stitched ones. 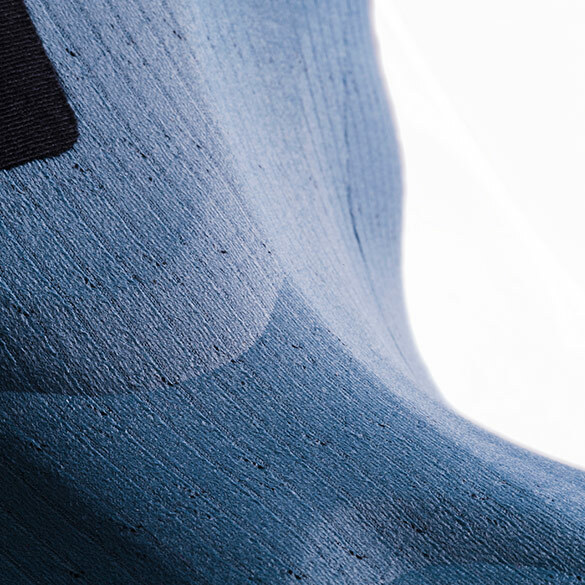 In the stitched chamois, the construction follows the traditional methods where different materials are combined together through a stitching operation. All the parts of the pad are stitched together using automatic machines. In the thermo-molded chamois, instead, the design is obtained through the creation of molds subjected to high temperatures. For the thermo-molded chamois, an innovative technology gives the typical curvature with multidirectional molds and counter-molds. Perfect fit in saddle also means no areas of transition between different foam densities and layers. We create soft edges and smooth areas of transition by cutting diagonally our foams. This gives our cycling pads higher stability in saddle and improved fit. The Air Mapping technology is the new concept developed by Elastic Interface®. During extra-long rides, when sweating is unavoidable, it is essential to keep the skin temperature as low as possible. Super air layers are not enough and this is why we design fabric-only tops, with holes that increase air permeability. Biomechanical tests carried out with Prof. Antonio Paoli M.D. and Dr. Giuseppe Marcolin PhD from the University of Padua have proven that every discipline demands a different position in the saddle. This means that the rider’s anthropometric measurements must be accurately calculated by industry professionals to ensure that the height and fore/aft position of the seat are right for the chosen speciality. An incorrect position may eventually cause spinal and joint pain and undermine sporting performance. An unsuitable pad can have a negative impact on your health and comfort and this will affect your results. This is why it is so important to only choose specifically designed pads. 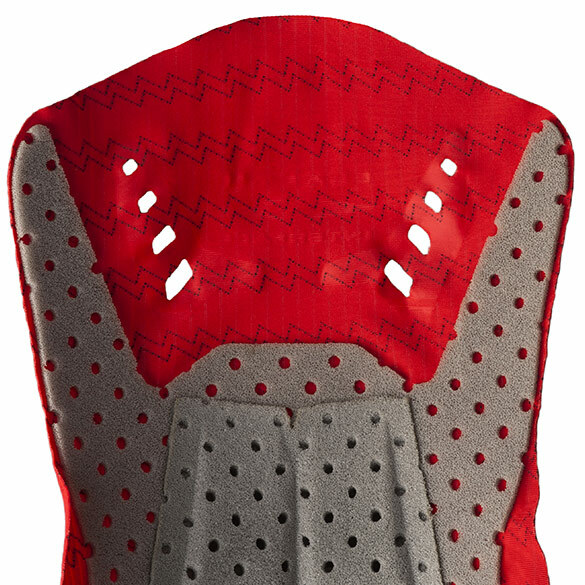 In addition to sport-specific designs, pads also come in different shapes for men and women as their bone structure and anatomy are very different.